You found the perfect partner... Next comes the perfect ring. You want to give your loved one something special that will remind them of you, each time they look at it. When they wear it out, they want a story to tell their friends and family about how you picked out the perfect ring and gave it to them. Did you know that your DIAMOND also has a love story to tell? It starts MILLIONS of years ago, long before you and your love ever met. It waited there for the perfect time to surface and then took a long journey to Belgium. Then George takes his annual trip to Belgium to search for the perfect diamond for you. Now this isn't just any ordianary diamond, it's a very rare and special one. We now make it possible for you to know the entire history of your diamond. 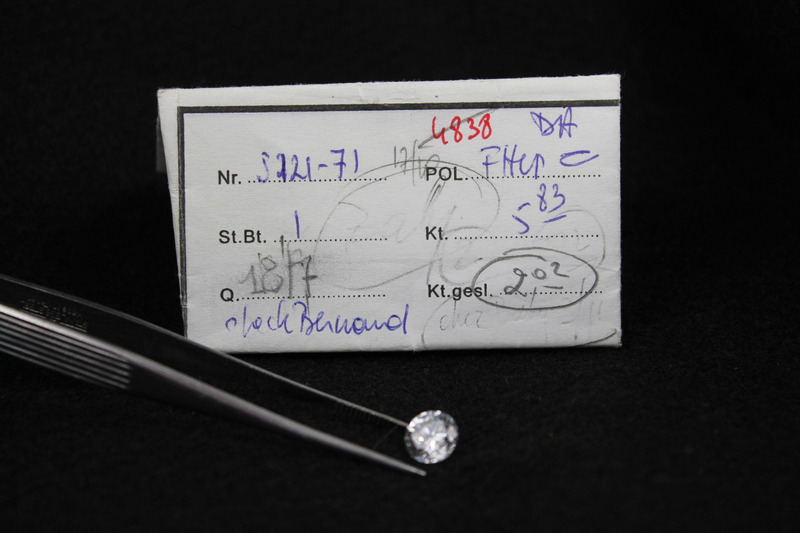 These ORIGINAL Diamond papers include the actual size of the rough Diamond before it was cut, the shapes that were considered making it into, and the actual handwritten notes in Dutch from your diamond cutter. It also tells you what date the Master Cutter drew the outline of your rough to create the perfect diamond! Shown below is the original Diamond papers from the Master Cutter for a Round 2.02ct Diamond, but what does it all mean? On the bottom photo, the "NR" is the stock number of the parcel of rough. Diamonds of this quality are rare and quite valuable. They used stock numbers to make sure all parcels were accounted for. The "St. Bt" is the number of Diamonds that are in the paper. On some ocasions you may have more than one in the same paper. The "POL" is the In House Grading that they used to grade the diamonds. The next is one of the most facinating tidbits of information for most people, it is "kt". Kt is the original weight of the rough. This specific diamond weighed 5.83ct before it was cut! The "Kt gesl" is the actual finished weight after cutting. As you can see on the top photo, there are two different diagrams of the different options they had to cut this specific stone. One was a round and the other was an oval. Each had an estimate ct weight if they were to choose that option. They would do this prior to cutting to see how large of a stone they can get out of the rough while keeping the brilliance and natural beauty of the stone. 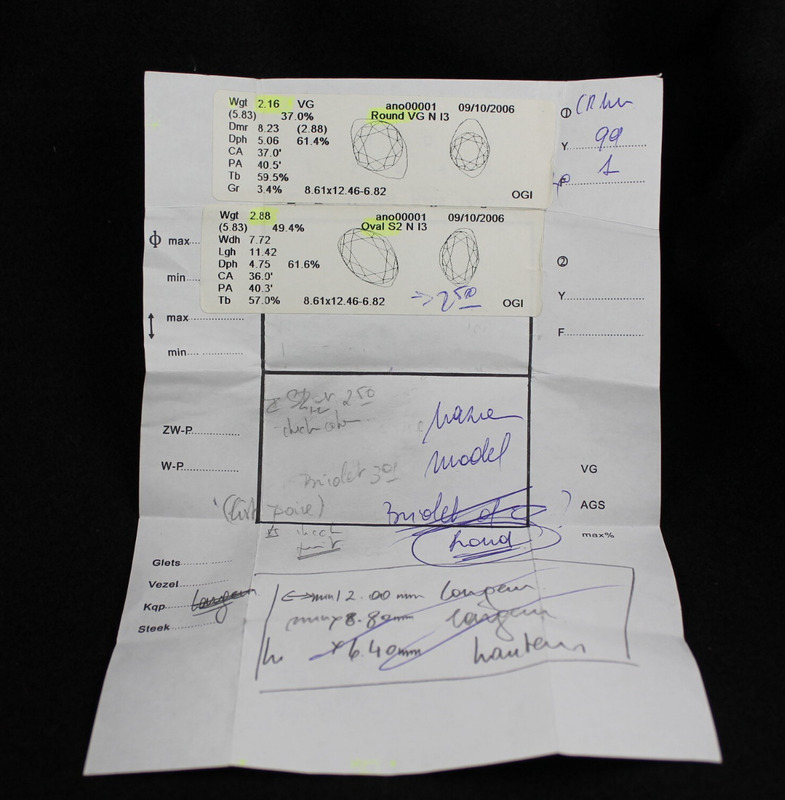 You will notice near the bottom of the paper, "round" is cirlced by the cutter. This indicates that they chose to go with a round instead of an oval. We have this actual Diamond in stock right now. Stop by to see (or buy) this extrodinary diamond that took a long journey from Belgium to Dickson City PA. When this diamond is put into their perfect setting, it isn't just a diamond. It's a legacy with a story to be passed on from generation to generation. George is leaving for Belguim soon so pre-order YOUR diamond with a story to tell today!